Chet Atkins's longtime sideman Paul Yandell has passed away in Nashville. Paul's dream as a young man growing up in Kentucky was to play with his guitar hero Chet Atkins and to play on the stage of the Grand Ole Opry. He realized both dreams, starting first with a job playing guitar for the Louvin Brothers and then Kitty Wells after which he played a five year stint with Jerry Reed before moving on to accompany Chet Atkins for over 25 years beginning in 1975. Chet and Paul playing on Nashville Alive! 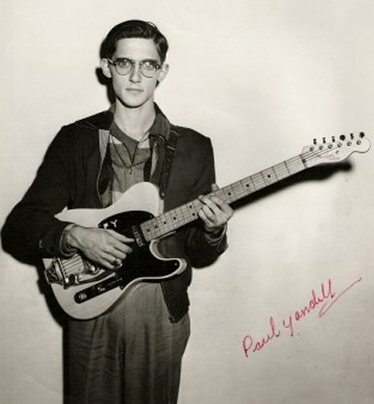 Paul was awarded the honor of being named Chet Atkins's 5th and final recipient of the CGP award (Certified Guitar Player) a self-designated degree Chet Atkins originally created for himself, but later awarded to other guitarists. Paul will be remembered for his masterful thumbstyle picking and for his unmatched accompaniment and complimentary rhythm alongside of Chet Atkins as well as his wry sense of humor and willingness to help others pursue careers in music.